Thousands of pilots and aircraft took part in WWII. Dogfights, bombing raids, observation, rescue, supply drops, paratroop hauling were just some of their missions. Air superiority played a key role in the Allied victory in Europe and continues to be a vital part of modern warfare. Can you define what air-superiority means? (Josiah) Air superiority is dominance of the air, allowing attacks on the enemy, and denial of enemy aircraft to access of the air. There are many definitions, but essentially, airspace must be controlled for friendly use and denied to hostile use. Did the air-superiority strategy originate in WWII or are its roots in a previous conflict? (Josiah) World War I really initiated the idea of air superiority. Commanders thought the airplane would only be good for observation, but WWI proved that air combat was a reality and that air superiority would be vital to success in modern conflicts. Did the Germans understand the importance of this strategy? If so, what held them back from ultimately achieving it? (Josiah) Yes, the Germans actually understood the concept of airpower and air combat much better than the Allies, at least during WWI and at the beginning of WWII. The “Fokker Scourge” (a time in 1914-15 [World War I] when the Germans completely dominated the skies) proved that German airframes and fighter tactics were far superior to anything the allies had developed. Even today, famous air combat tactics such as the “Immelmann Turn” bear the names of German tacticians. The Germans did have air superiority at the beginning of WWII, considering that blitzkrieg could not have happened without it. The Germans developed the two-ship*** fighter formation in WWII, whereas the Allies started out using the highly ineffective three-ship*** formation. As time went on and the Allies became stronger, the Germans lost their edge in the air, largely due to sheer aircraft production numbers and advancing aircraft tactics. We hear a lot about the Allied bombing raids of WWII. Can you explain what they were targeting and how this fit into the overall strategy? (Josiah) The raids mostly targeted factories, oil refineries, military compounds, rail yards, and other infrastructure targets. Any industrial center was a target. The Allies knew that if they could cut off the supply of military equipment and fuel, the Axis could be defeated. Furthermore, if the transportation links could be cut, then military assets could not move efficiently. This proved true, and by the end of the war, the Germans had some equipment [left], but no fuel to operate it. Let’s bring the discussion to an “individual viewpoint.” How much training had these Allied pilots received before they were sent into combat? (Josiah) The answer varies a lot. 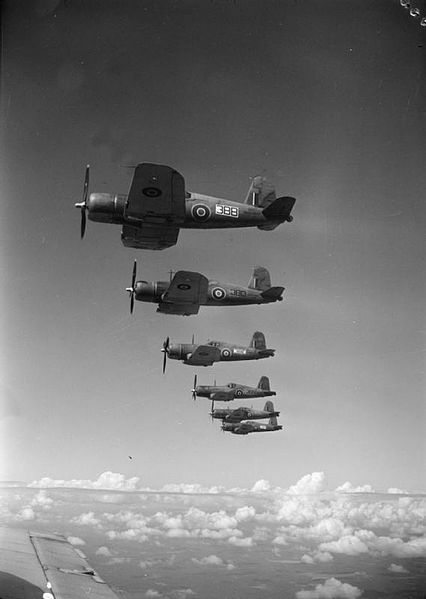 At the beginning of the war – say during the Battle of Britain – pilots had only two hours of training in fighter type aircraft and some elementary ground instruction. A little later in the war, a general told bomber crews that they could “learn to fly the planes on the way to the target.” American pilot training actually became good for its time as the war went on. Crews were trained together, knew their aircraft well, and operated with deadly precision. Tell us about some of the most famous aircraft in the European theater. Do you have a favorite and why? (Josiah) The Battle of Britain (1941) immortalized the Supermarine Spitfire, which was a beautiful British fighter. However, the Hawker Hurricane (another, less advanced fighter) actually did most of the work at the beginning of the war. 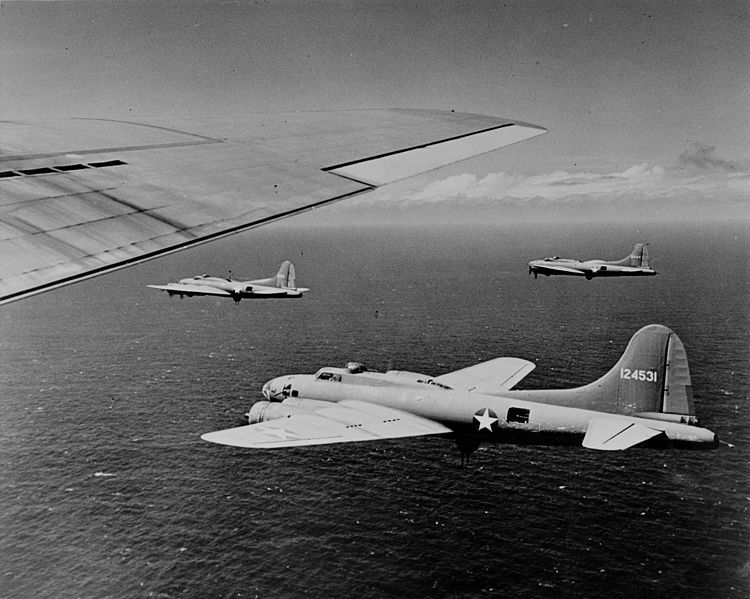 Famous Allied Bombers include the B-17 Flying Fortress, the B-24 Liberator, and the Lancaster (British). The B-17 is the most famous, perhaps for its ability to bring crews home despite unbelievable damage, while the lesser known B-24 was the most mass-produced aircraft of the entire war. 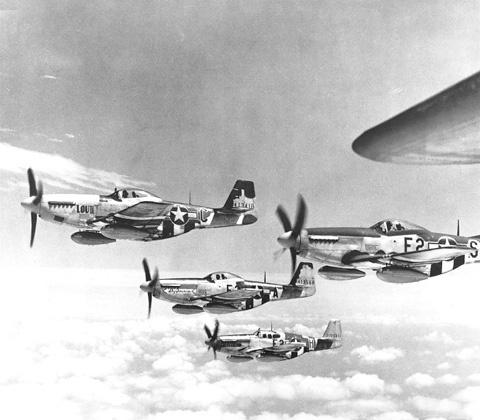 On the American fighter side, the P-51 Mustang will always be the star, but many other types such as the P-47 Thunderbolt, the P-38 Lightning, and P-40 Warhawk were used. The Germans had the Fock-Wulf 190 and the Messerschmit BF-109. I probably have to follow the crowd and say that the P-51 is my favorite. Not only is it a beautiful aircraft, but it was also one of the best fighters of the war. We’re now 70 years since WWII. Does air-superiority remain a key factor in modern warfare? If so, what does it look like today? (Josiah) Air superiority is more important than ever. It would be difficult to win a modern war without controlling the air. Today, as in WWII, air superiority is achieved through high performance fighter planes that can shoot down anything else in the sky. We now rely on advanced features such as jet engines, stealth, beyond visual range capability, and thrust vectoring*** to achieve performance levels that were unimaginable just 70 years ago. 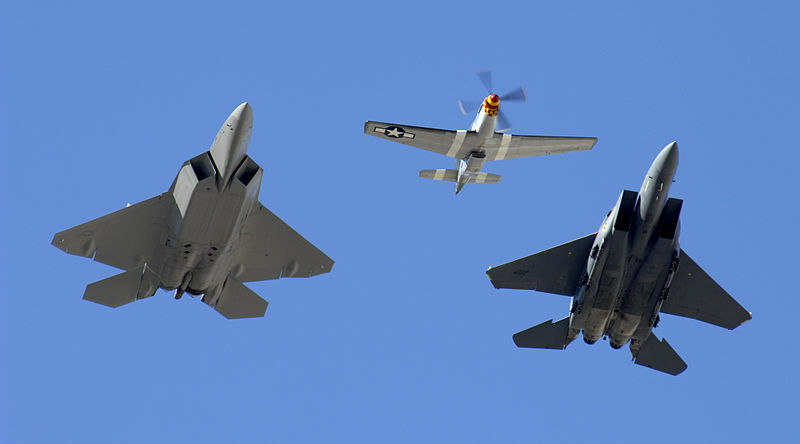 Modern Day Heritage flight with an F22 Raptor, P51 Mustang, and F15 Strike Eagle. Symbolizes the past and present of air superiority. Do you think the concept of air-superiority will remain important in future conflicts or will technology force us to move toward something else? I believe air superiority will remain vitally important to combat success. However, as technology moves on, other fields will determine the success of the airpower. Here is a scenario that we are seeing develop: forces on the ground rely on air superiority for success; air superiority relies on space power for success; and finally, space power relies on cyberspace power for success. It is important to realize that if any link in this chain is broken, military dominance in modern warfare may not be assured. Space and cyberspace power will likely continue to develop rapidly as we push out of earth orbit and continue developing “smarter” and faster computers. A big thank you to Josiah Bierle for being our guest today! What interesting facts and amazing insight. It will certainly be exciting to see how the concept of air superiority continues to develop. Favorite aircraft of WWII is the P-38 Lightning. It is any amazing plane to see fly. That’s a cool plane, Nathan, and there are some great stories about its missions!